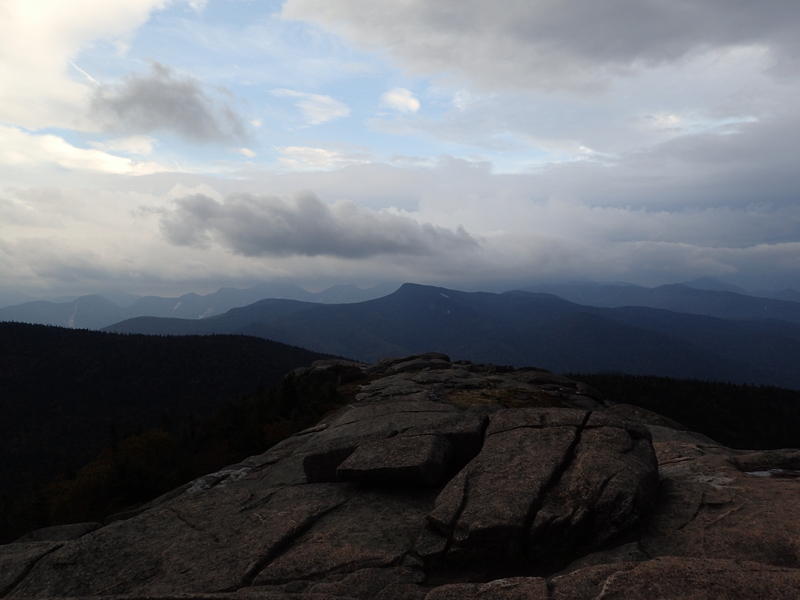 This weekend in the Adirondack High Peaks was a little different than usual as I brought my girlfriend Kelly with me for her first ever Adirondack High Peaks experience. Since it was her first time hiking in the area I decided to pick some easy classics to start with because I wanted to still be on speaking terms when we left. That being said Allen was definitely out of the question. We arrived later in the afternoon on Saturday at about 3pm and parked on rt 73 at the Cascade Lake trailhead with the intention of climbing both Cascade and Porter. We didn’t have a ton of miles to cover but since it was so late in the day when we started we planned accordingly and made sure to pack our headlamps for a night time exit. I have climbed Cascade before in winter but when I did I never got a view due to bad weather and even neglected to climb Porter so it was still a worthwhile trip for me to check off one more peak and hopefully get a view this time. 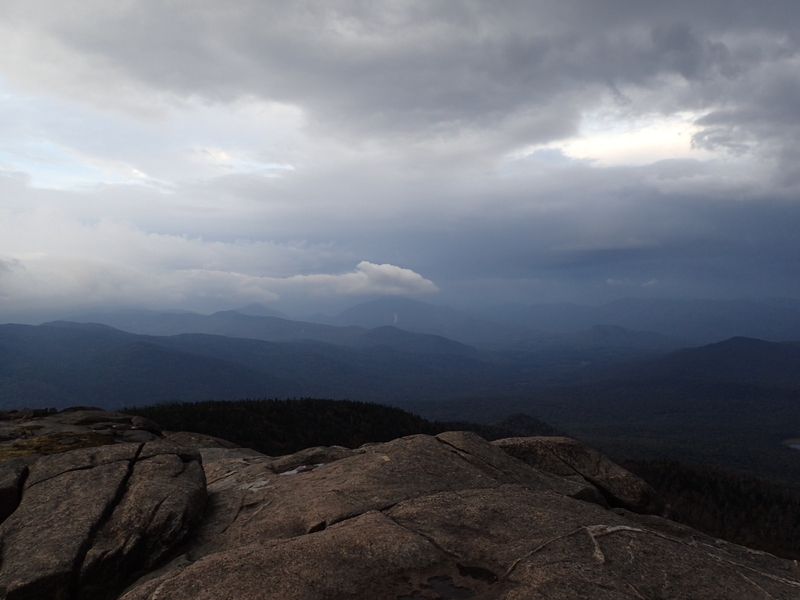 It looked like it was going to rain before we even hit the trail but luckily the weather held for much of our hike. We geared up and set out on the trail at roughly 4pm. Trail register at the start of the hike. 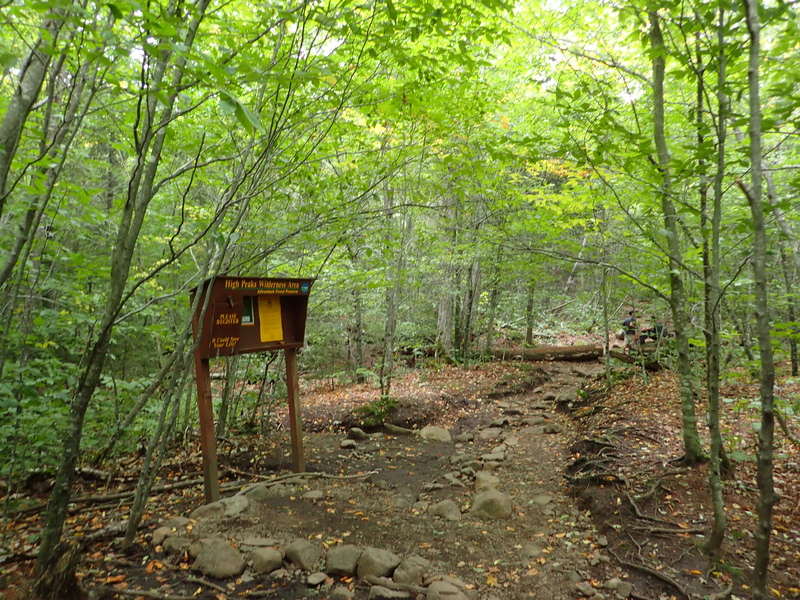 The hike overall is very straight forward and the trail is in pretty decent shape despite how well traveled it is. We saw droves of people coming down as we got started going up but after we passed them we didn’t see anyone else for the rest of the hike. 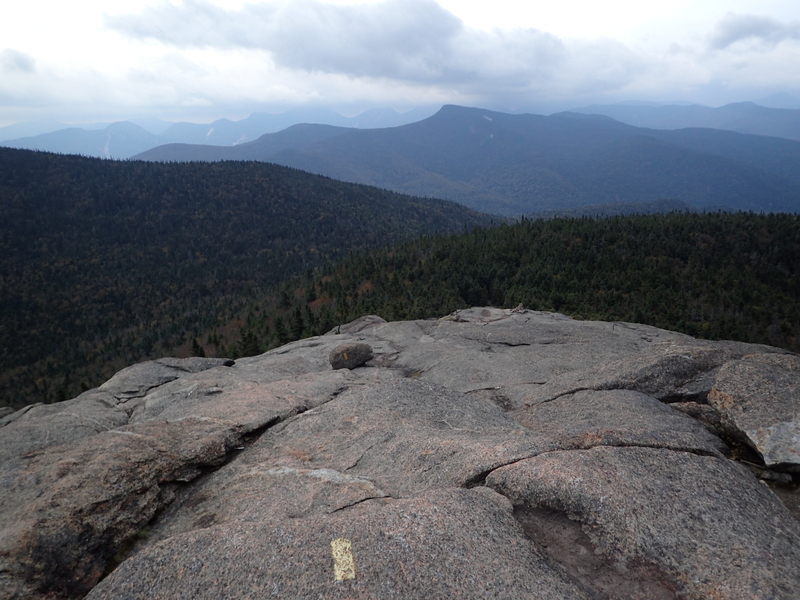 Although the mileage overall is pretty short, especially by Adirondack High Peak standards, it still gains a fair amount of elevation in a short distance. Dirt trails with minimal boulders give way to short slab sections as you get higher up. The trail itself is not terribly exciting as there are no real views or brooks until you make your way nearly to the top, but there are sections of short low angle slabs that add a little bit of character. 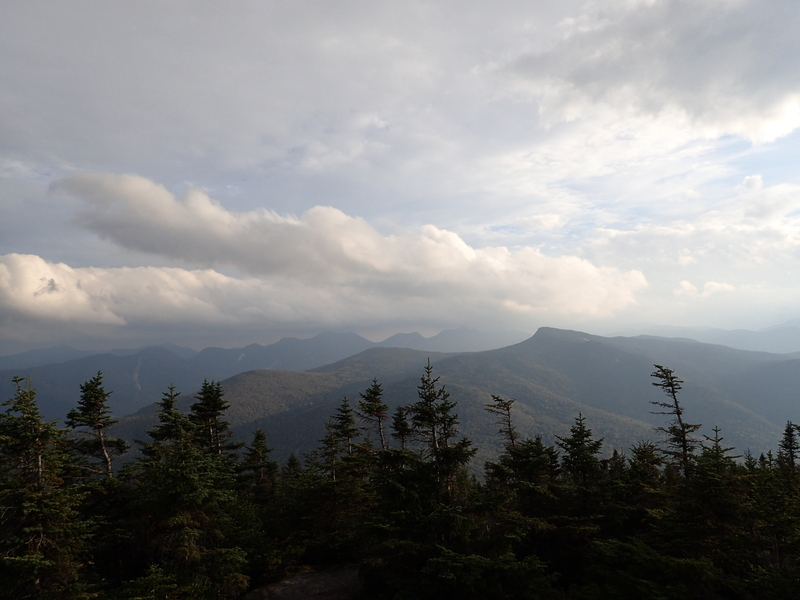 This also makes this peak a great choice for newcomers or hikers which want an easier first experience in the High Peaks. 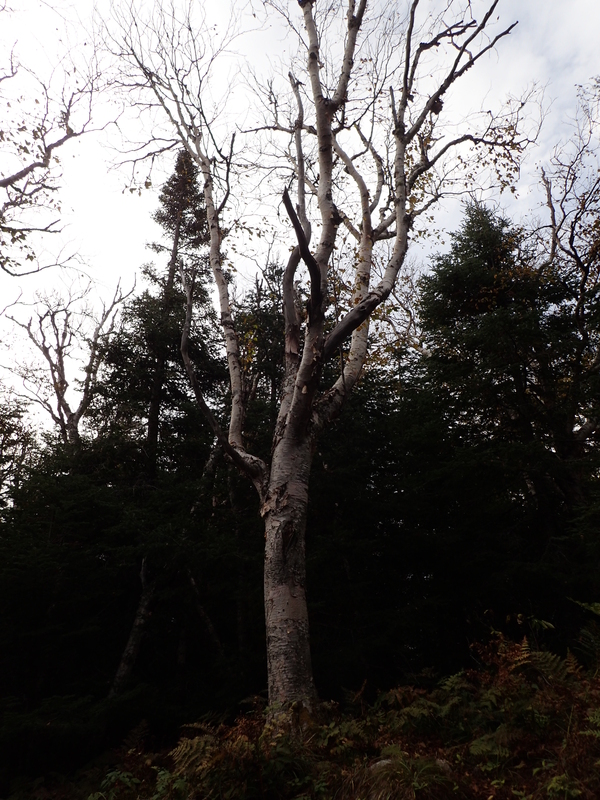 Birch tree along the trail. 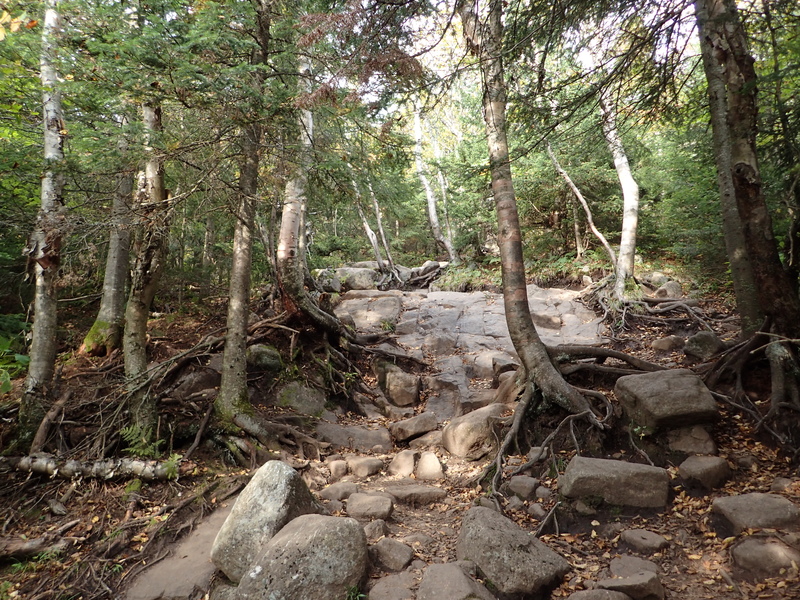 The trail maintains a pretty constant mellow grade from essentially start to finish. The trail is also nice and mud free which is a plus. 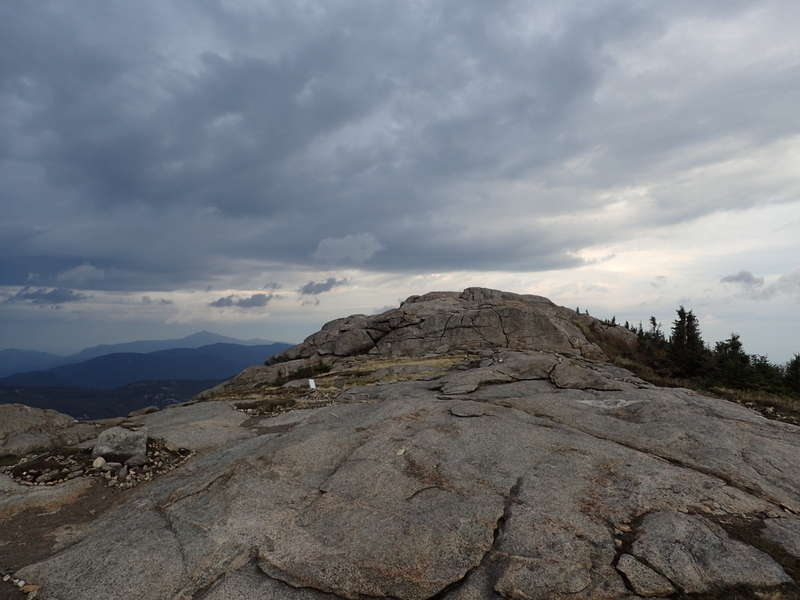 As you near the top of the ridge you will begin to see more interspersed slab sections which are not steep but do break up some of the monotony of the hike. 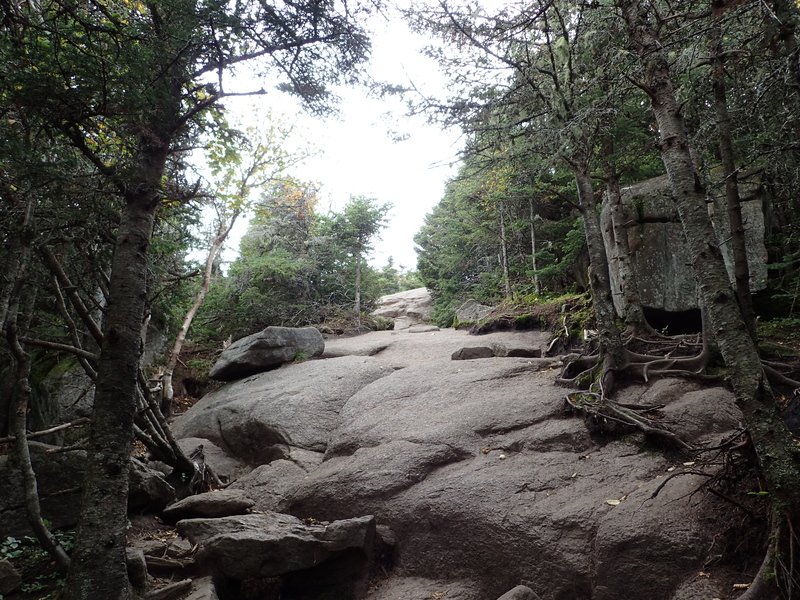 If this is your first hike in the High Peaks it may seem a bit boring at first but hang in there because the views are totally worth the effort! One of the longer slab sections nearing the top of the ridge. Once you reach the longer slab sections and climb up them you will reach an open clearing among some shorter trees which will offer you your first beautiful view of the surroundings. Once we reached this point the clouds were really rolling in on us but luckily there was still enough sunshine to give us some pretty awesome views. The first view we received as we crested the top of the ridge. 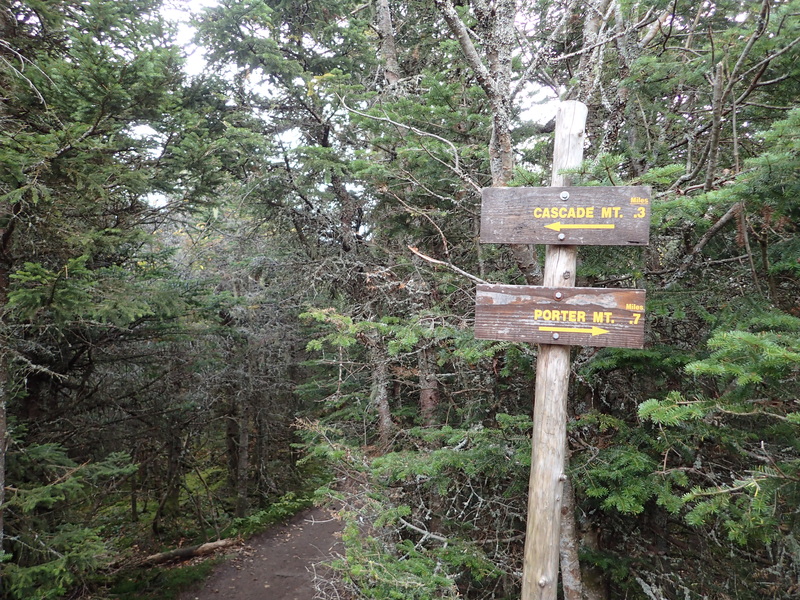 From this point it is just a short section of hiking before you reach the trail junction separating Cascade and Porter. 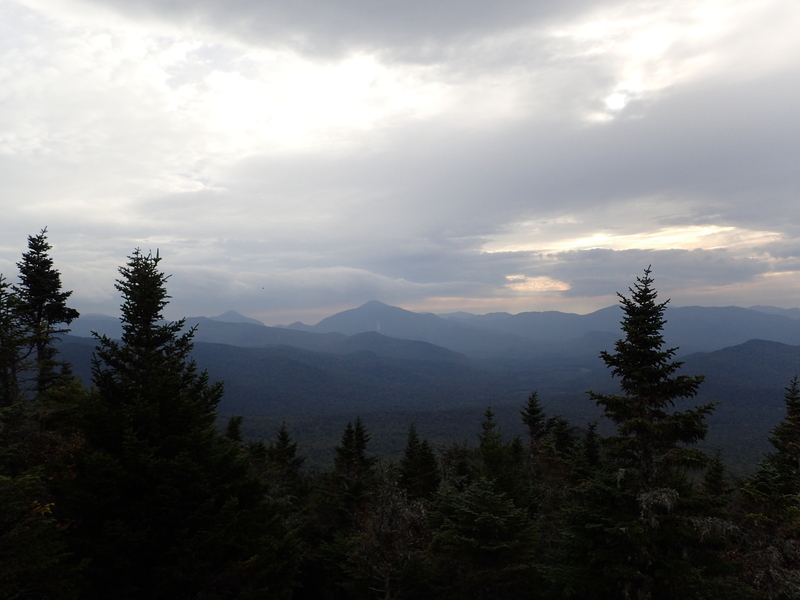 We decided to continue on to Porter first as it was the furthest away and being that we still had a little bit of time before the sun set we were hoping that if the clouds left us we could get a stellar sunset view on Cascade. The trail to Porter is fairly flat with only a small dip into a shallow col between the two peaks. 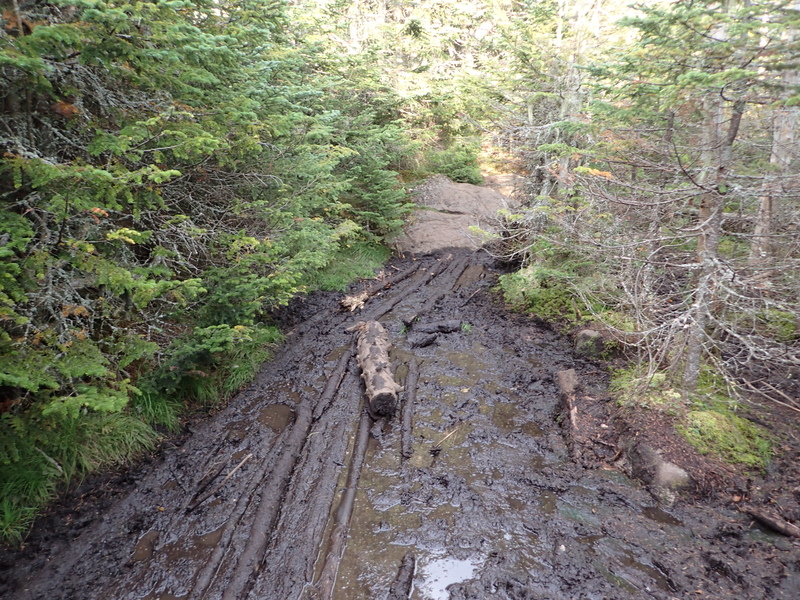 The trail to Porter is also in decent shape but does have quite a bit more mud than you encounter only hiking up Cascade. Muddy trail on the way to Porter. 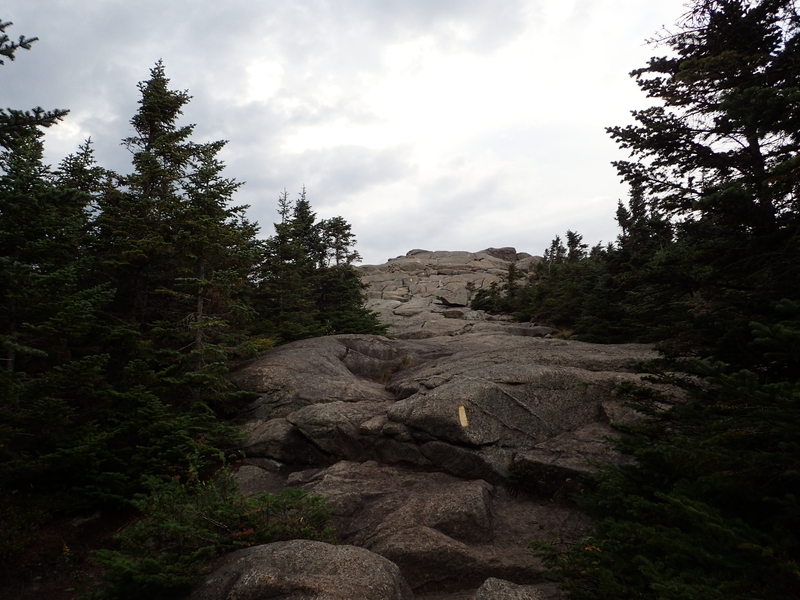 The peak of Porter is really more of a small rocky ridge than a true summit but thankfully the trees are still quite short surrounding it so it does offer some nice views. It was fun to watch Kelly’s excitement on the summit of her first High Peak and reminisce about my own first summit back on Mount Colden in the winter of 2012. Looking back at Cascade from Porter. We spent a good amount of time enjoying the view on Porter before making our way back to the trail junction for Cascade. The hike back to the junction was done in no time and we made great time. 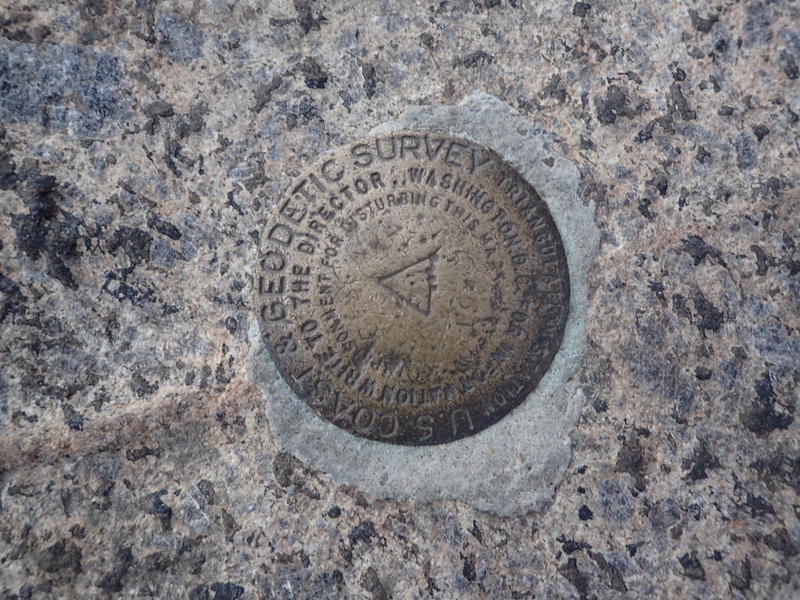 Once there we hurried up the last 0.3 miles to the summit. Cascade is a pretty great peak as it has a bare summit with some of the best views of the surrounding High Peaks. The last 0.3 miles goes quickly and within just a short distance you begin making your way up the bare slab of the Cascade summit. Start of the slab leading up to the bare summit of Cascade. Once we got above the tree line we were greeted by incredible views and pretty fierce winds that are quite common on the summit of Cascade. We stopped quickly to put on our jackets and then quickly hiked up to the top of the summit. Nearing the top of the summit ridge. Lucky for us the weather still continued to hold and despite the high winds we were able to enjoy the beautiful views around us. We were not able to see a clear sunset due to the cloud cover but the conditions did create some really fun light for photographs. We spent a good amount of time taking in the summit until the sun dropped behind the mountains and we decided to start making our way back down the mountain. At this point it was essentially completely dark and we pulled out our head lamps for the rest of the hike in the dark. At this point it did also start to rain pretty hard but luckily we were already below tree line and on our way back down the mountain. 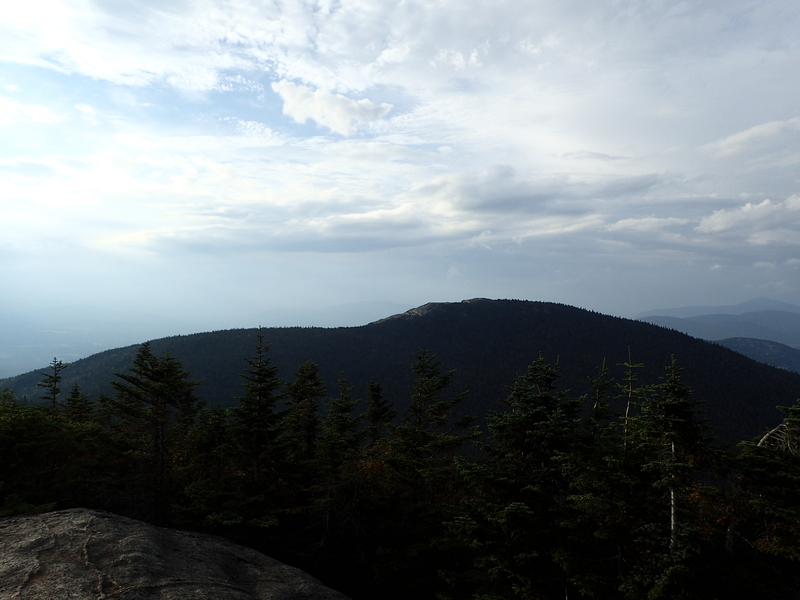 Besides being a little wet the hike down was uneventful and we made quick progress despite the precipitation. We made it back to the trail head at 8pm. All in all it was an awesome hike and we had a really great time. Kelly enjoyed her first High Peak and even picked up a High Peak journal from the Mountaineer to start tracking her own journey to 46. I would highly recommend doing Cascade and Porter if you haven’t before. It is a great hiker for hikers of all abilities and can even be done with limited time as most people complete it in 2.5-4 hrs.